PRO CAREER: Promising, young center re-signed with Chicago after spending the 2004 training camp with the Bears& Allocated to NFL Europe and gained on-field experience during the 2005 season for the Rhein Fire& Spent the 2004 season as a free agent. CAREER TRANSACTIONS: Entered NFL as an undrafted free agent, signing with Chicago (4/26/04)... Placed on waivers by the Bears (8/30/04)... Signed to Chicago's reserve/futures list (1/3/05) and allocated to the Rhein Fire of the NFLEL. SIGNED through 2006. 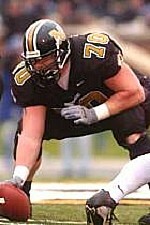 2004 SEASON: Spent his rookie season as a free agent after being waived by the Bears during training camp. GAMES PLAYED-STARTED: 0-0. COLLEGE: Started all 47 games in his collegiate career, setting a school record for most consecutive games started... Tabbed first-team All-Big 12 by the league's coaches and the Dallas Morning News and to the second team by the Associated Press as a senior... Named Missouri's Offensive Linemanof- the-Year after he helped pave the way for an offensive ground game that led the Big 12 and ranked 6th in the nation in rushing... Named to the second-team All-Big 12 by various outlets and honorable mention All-Big 12 by the Associated Press following junior year... Received first-team Academic All-Big 12 honors... Majored in business. PERSONAL: First-team All-State selection as a senior who led his team to the Texas Class 5A playoffs and was rated one of the top players in the state by every major recruiting service... Selected Homecoming King of Klein (Texas) H.S.... Member of FFA, FCA and Young Life and Bass Club... Son of Tom and Angela Ricker.